Get 20% off all Perfect Size FuzziBunz at ClothDiaperKids.com, while supplies last. Full color selection to choose from. (Reg. 23.95) on now for just $18.99. Shipping rates start at $5.99. Sale ends Dec 31, 2010. 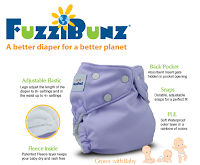 1 Response to "20% Perfect Size FuzziBunz at ClothDiaperKids.com"
They just lowered the FuzziBunz even more to 33% off!